Macy’s beauty subscription box sends you deluxe product samples, a bonus item, and a collectible cosmetics bag. Plus, you also get a $5 beauty coupon for use in-store and online. The Products: Each month you will receive five deluxe beauty samples, one bonus item, a collectible cosmetics bag and a $5 beauty coupon exclusively for Beauty Box subscribers, available for use online and in-store. Ships to: the 48 contiguous United States. The Macy’s Beauty Box cannot be shipped to PO Boxes, APO/FPO/GPO address, Hawaii, Alaska or U.S. Territories at this time. Check out all of our Macy’s Beauty Box reviews! 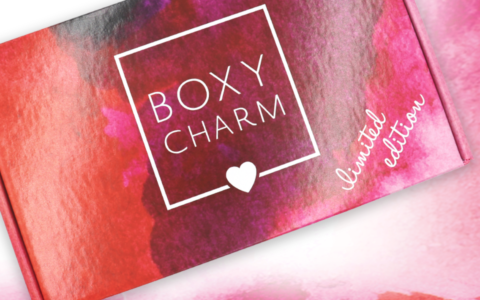 Check out more beauty subscription boxes in the Women’s Subscription Box Directory! You’ll also receive a $5 off coupon, which is good for beauty purchases in-store and online. This is my favorite bag design yet! Clear and practical, but holographic to keep it fun? Yes, please! I was traveling this past week, and I packed this mask for hydration post-flight – it was great! I normally take off masks once they hit the minimum time needed, but this time I left it on for all 20 minutes. This is a purifying mask designed to “draw out deep-dwelling pore-cloggers, impurities and debris.” And it works! My skin felt significantly smoother and cleaner after I removed the mask. And it didn’t dry my skin out either – impressive! This is a lip gloss/lip stain hybrid. You can apply multiple coats to get a full-coverage look, too. This is a rich and decadent eye cream. The color is supposed to help color correct and brighten, in addition to the formula reducing the look of puffiness, dark circles, lines, and wrinkles. I personally didn’t notice any brightening changes, so I’ll stick to using this at night only since it takes a while to absorb. This is a sweet fragrance with notes of Jasmine Absolute, Wild Tuberose, and Dewy Honeysuckle. It’s not for me (I’m not much of a perfume wearer), but I’ve always loved Juicy Couture perfume bottle design, and this full-size version is another fun one! Verdict: This box has an estimated value of about $38.34 (not counting the makeup bag.) I think that’s a decent value for a $15 beauty box. The makeup bag and $5 coupon definitely help, too. I liked almost all of the products, and sample sizes were good, too. Can you still get this box if you sign up today? No, right now the site says your first box will be the September box if you sign up today. Coupon – None available for this subscription. This was my first month with Macy’s and I was pretty happy with it. The eye cream is great and the sample should last for quite a while because you only need a tiny bit. I really like the fragrance and I’m excited to try the Urban Decay setting spray. I even liked the iridescent bag. So this was a definite win for me. I canceled Ipsy in January. I only got a few boxes. Just wasn’t for me. I like Macy’s much better. FYI I got billed on the 27th of July for this box but I did receive it on the the 2nd of this month. That was a bit wonky and they put the hold on double the amount but then 1 dropped off when it posted. That said, I have gotten this box since it started and overall it’s always useable but not very exciting. I’m tempted to replace ipsy with this box. Ipsy ends up being disappointing month after month, not getting the spoilers I wanted. And I like the brands in macy’s. I had this for several months and loved it. Never had an issue. I just decided to try some new things so I cancelled last month. Same for ke. I just don’t want to deal with being double billed for my subscription. It looks like Macy’s is way better then ipsy. I know Macy’s has been plagued with billing issues. Has that been resolved or are there still problems? Also does Macy’s do variations like do many other subscriptions or does everyone get the same product and color? I wouldn’t say Macy’s has any billing issues. They don’t double-bill you, there might be a second *hold* which is then removed. I have personally never been double billed. Maybe I’ve just been lucky? But it’s never happened to me. I’ve been with them since February. Everyone gets the same products. I saw that someone said colors vary, but I’ve always received the color shown on MSA’s reviews. This month was the first lip product since February (I think), so I guess there haven’t been a lot of lip products shades to report about. NOT having variations was a major motivator for me to start this sub. Also that name brands are featured. Finally, the bags (if you’re into bags) are of good quality, in my opinion. I have been very happy with my decision to do Macy’s. Plus the $5 gift card is nice. We’ve gotten $10 cards twice since February. You can use them in store and online. There is no shipping fee (another perk) for beauty products on Macy’s.com so you can spend the gift cards easily and not loose out on the shipping end. They have plenty of masks, micellar water, cleansing wipes, Burt’s Bees products, etc. for $4 and up. Sorry that was kinda long! And, I never tire of saying this, you can use each coupon twice! That brings down the cost of the sub to $5. And on the months with $10 cards, the value of the coupon exceeds the cost of the bag. Im having trouble using this coupon. Does it only work if my total cost exceeds $10? I see – Thank you for the info! That sort of takes away from the value for me. I feel like they didn’t clearly note that on the coupon. The way I use Macy’s coupons is to buy expensive items that are on sale, or if there is some gift with purchase that I want. For example, I bought an $85 Peter Thomas Roth eye cream for $32.50 when it was half off. The Tarte “Miracles of the Amazon” palette (it was sold at Macy’s in a set with lipstick and mascara) I got for next to nothing when they had it on one-day sale for something like $21. I don’t really care about the cheap items that I can just as well get at Target. I absolutely love this bag also, very pretty.